Our annual spring trip to Yellowstone National Park happened about two weeks earlier than we usually go. Family obligations in the latter half of the month kept us from going later. As it turned out, it was a good decision. The West, including YNP, had a very warm and dry winter and spring. The park looked a little sad due to the fact that there was very little water. The ponds and streams that are usually full this time of the year were mostly dry. Even the larger rivers, like the Yellowstone, were very low. Because of the warm winter, Lake Yellowstone was completely free of ice. Very unusual as I have seen the large lake frozen solid, even into June. There was very little snow, even though we did have one day of heavy snow which was gone the next day. A lot of wildlife in the Tower area and the Lamar River Valley. The rest of the park was bare. We did not see an animal in the center and southern part of the park except for a few large single bison. There were a lot of bears out, with more black bear cubs this trip than we have seen in the past. There were triplets, twins and singles with solid black to cinnamon to chocolate color. 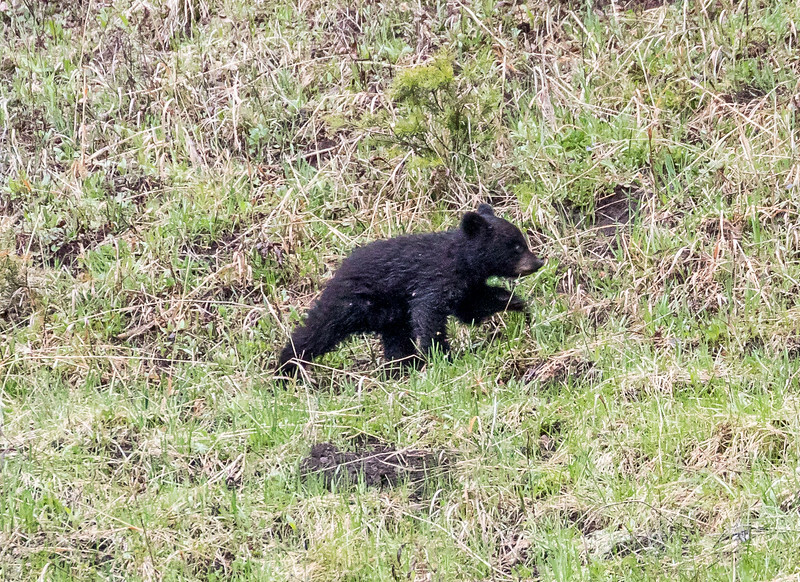 We saw a total of a dozen different black bear cubs. We photographed a total of five different large grizzles that were well within the range of our camera. Old Scarface is still around and the rangers say that he is over 25 years old. This early in spring we only saw the baby bison and the black bear cubs. It was still too early for the elk, deer and antelope. In all, it was a very good trip as all trips to YNP are. We had weather from snow, rain, sunshine,with temperatures in the teens in the morning to around the upper forties in the afternoon. As usual, it was hard to leave, but hopefully there will be next year.